Ticket King Milwaukee Wisconsin: Ticket King Milwaukee Watches Favre Throw it All Away! Ticket King Milwaukee Watches Favre Throw it All Away! I've always been a Green Bay Packer fan. That doesn't mean I've always been a Brett Favre fan though! Watching the NFC Championship Game last night I had mixed feelings. On one hand I wanted the Minnesota Vikings to win because I wanted to support our Ticket King Minneapolis office. On the other hand, I wanted to see Favre loose it at the last minute for his new team. I'm I huge Packer fan! 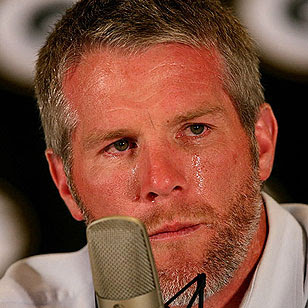 Either way, the outcome was going to be, I was hoping Favre would finally hang it up after this game, and retire. It's been a long time coming and frankly I'm sad to see him in the spotlight VS my guy Rodgers! In overall stats, Favre falls short of Rodgers, but because of the drama that comes with Favre he always seems to be in the spotlight. I will say this however, it was a great close game and Favre and his team did play their hearts out, but unfortunately it wasn't good enough. After a long game of three or so ties and then into overtime, the Saints won 31 to 28 with a 40 yard field goal. The outcome of this game means that the Saints will take on the Colts Sunday February 7th in the 44th Super Bowl in Miami. Don't get me wrong, I think Favre is a great athlete and has done a lot of great things in his career, but after his loss yesterday, I really hope he finally retires. It would have been great to see the Green Bay Packers get as far as the Vikings did this season, but like they say, there's always next year! And believe me, along with everyone at Ticket King In Milwaukee and Green Bay, we have VERY high hopes for the Packers next season!